Born in Melville, Saskatchewan, Canada, on the 20th of July 1971, Mike Morin began his hockey career at NCAA level, playing for Lake Superior State University for 4 seasons between 1991 and 1995. Morin was a regular and reliable first team player, icing in 165 games and scoring 129 points in the process. After his college education ended, Morin signed with ECHL team, the Richmond Renegades where once again he would produce an excellent point’s return, 38 points scored over 47 games. Also in the 1995/96, Mike Morin would line up for Boston Bruins affiliate the Providence Bruins which saw him gain 9 points in 25 games. 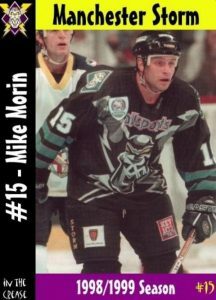 It would be the 1996/97 season that saw Morin make the move to the UK’s Superleague and the Manchester Storm, Storm were in their second season and after winning the old 1st Division and found themselves having a tough first season in the Superleague, this didn’t stop Morin still managing to accrue 33 points from 39 games. In total Manchester Storm’s number 15 made 327 appearances over 6 seasons for the Manchester storm, scoring 146 points with 69 goals, 77 assists. It wasn’t all about points with Mike Morin though as he had proved himself somewhat of an ‘unsung hero’ to the Storm fans, his hard work, dedication and versatility saw him became one of the most important players of the franchise’s history. Over his career Mike also iced for Hull Thunder, Sheffield Steelers and the Manchester Phoenix before his retirement from ice hockey at the end of the 2003-2004 season. He set up his own Landscape and gardening business (Mo for less Ltd) and settled into family life living and working in Greater Manchester. Fast forward to 2015 and Manchester Storm’s return, after a whirlwind start to the 2015-2016 Elite league season Mike Morin was spotted in the crowd having attended a game with some friends and family. 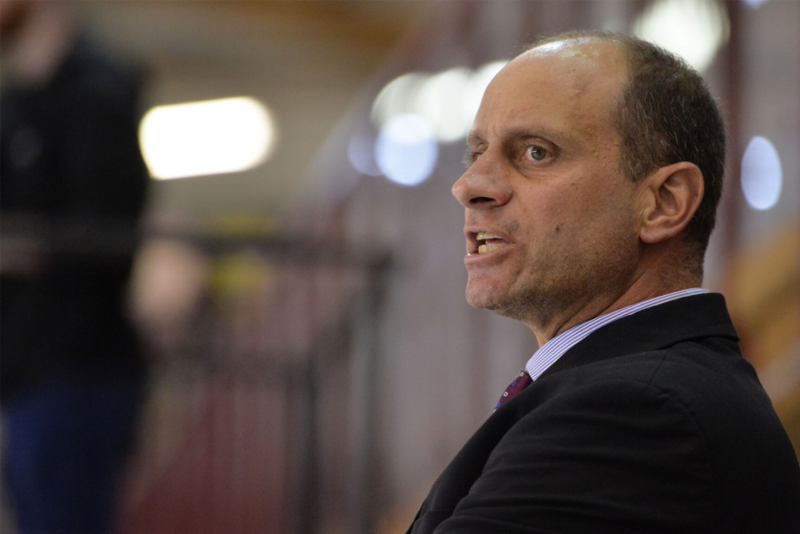 He was soon talking to the club and come the 24th of November 2015, Mike Morin was back at the Manchester Storm. Appointed Assistant coach to Omar Pacha, Morin offered some much needed help and guidance off the ice for the fledgling franchise and the club in gratitude to him for his efforts not just as assistant coach that year, but also for what he had done for the past franchise too decided to bestow upon him the highest honour in ice hockey, they would retire the number 15 jersey the following season. On the 12th of November 2017 Mike Morin’s number 15 was raised to the rafters alongside his old team mate Brad Rubachuk’s number 41 the only other jersey to be retired at that time. 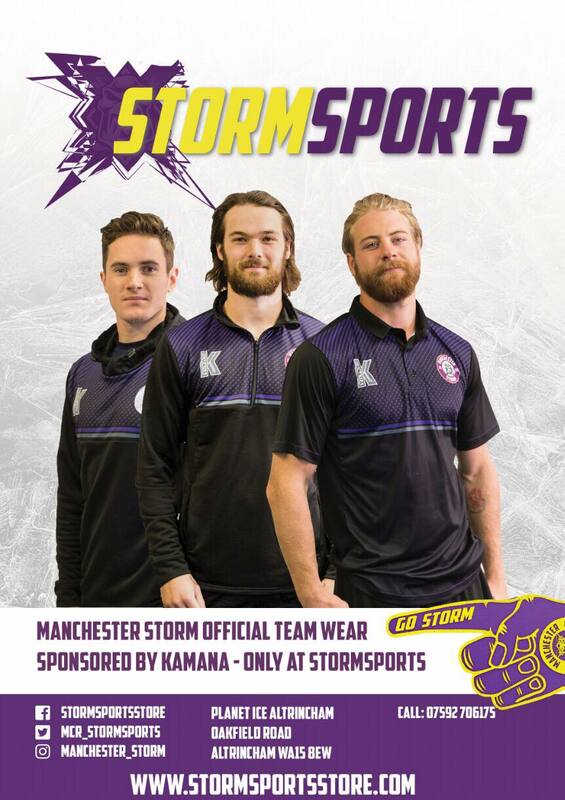 The 2018/2019 jerseys bear both of these numbers on their sleeves in honour to these outstanding servants to the club, once part of the Storm, always part of the Storm.